Finding the right hiking boot can be a challenge. The most important aspect to choosing a hiking boots is comfort. Also, the boot should match the hikers ambitions. Day hikers, hiking upon a well-maintained trail, may only need a lightweight trail runner. 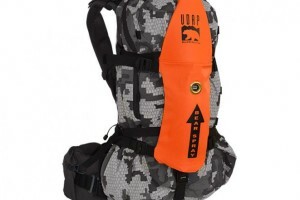 A backcountry hunter, however, may need a much stiffer boot, designed for steep, rocky terrain. Hiking shoes and trail runners are lightweight options, and many day hikers and backpackers carrying light loads will wear trail runners, because of the lightweight, supple fabric. Shoes are generally more comfortable and forgiving. However, the comfort of wearing shoes does have a tradeoff, because most shoe styles do not offer quality ankle protection. A hiker travelling over steep, rocky terrain, or someone who needs to carry a heavy pack, may need to forgo that comfort for the stiffness of a boot. Backpacking boots are usually stiff, and the boots are usually cut higher up on the ankle for protection. These boots enable the hiker to carry heavy loads. The stiff boot also helps the hiker on rocky terrain, because the foot doesn’t flex with the edges of rocks, and, when hiking on steep terrain, the stiff boot will help with a hiker’s fatigue. The one thing to remember about stiff boots is that there are break-in requirements. A boot may feel comfortable in the store, but when it is worn for a mile or so, the stiffness of the boot can tire out the foot much more quickly. Also, feet swell after strenuous use, and when feet swell, the boot becomes much more tight while hiking. If the boots fit well, then after the break-in time, they should become more comfortable. Mountaineering boots are very stiff and offer a great amount of ankle support. Mountaineering boots are usually worn in very steep terrain or on icy, glacial terrain. The boots are also important for ankle protection when carrying very heavy loads. When you have determined which boot matches your ambitions as a hiker, there are several things to consider when you choose your own boot. When purchasing a pair of boots, make sure that the boots fit. This sounds like a simple suggestion, and in many ways it is, but boots are worn in demanding locations. A dull pinch on a big toe, or a subtle pressure against the front pad of the foot can translate to an unbearable pain on the trail. Also, when you are trying on hiking boots, make sure to wear the same type of socks that you will use in the boots. If you are hiking in Merino Wool socks, for instance, don’t try on the boots with your sheer black business socks right after work. Also, if you wear orthotics, make sure to take those with you, because the cut on the orthotics, plus the size of your foot, may not match the foot bed of the boot.